Ugadi Pachadi - Bevu Bella: How To Prepare Ugadi Pachadi? Ugadi Pachadi or Bevu Bella is an indispensable offering on Ugadi, the Kannada and Telugu New Year day. This unique Bevu or Neem leaf preparation symbolically represents the different facets of life – sweet and bitter experiences of life. Bevu Bella is just a simple mixture of fresh neem leaves and unprocessed broken jaggery. 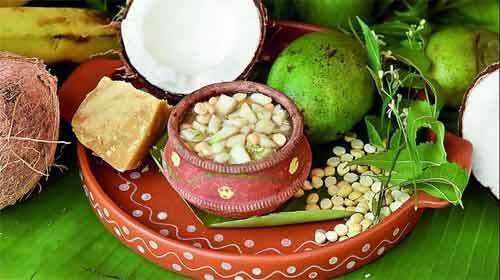 It is usually offered as a Prasad on the morning of Ugadi in many temples in Karnataka and Andhra Pradesh. It is also prepared in almost all homes. Handful of fresh neem leaves. Add jaggery into the mixture. Some people to avoid the bitter taste of neem add banana, honey or grated coconut. Bevu Bella is eaten on empty stomach on the Ugadi day. Mix jaggery and tamarind paste in water and make a thin liquid. Add banana, raw mango, grated coconut and neem flowers. Add salt and chilli powder. Jaggery proportionate to the number of neem leaves. Mix tender leaves and jaggery and serve dry. Another preparation during Ugadi is the Neem flower pachadi or Veppam poo pachadi. How to observe Ugadi and Ugadi Panchanga Pooja?